Nishit and Dipti Dalal are both employed and bring in a combined monthly salary of Rs 1.68 lakh. They stay in their own house in Ahmedabad and have bought another house worth Rs 60 lakh as an investment. They have taken a home loan of Rs 12 lakh and a car loan of Rs 5 lakh, and are paying EMIs of Rs 26,900 for both. The couple’s portfolio includes Rs 1 lakh of cash, Rs 1 lakh of gold, equity in the form of mutual funds (Rs 15.9 lakh) and stocks (Rs 1.4 lakh), as well as debt in the form of PPF (Rs 5 lakh), EPF (Rs 2.5 lakh) and debt funds (Rs 1.5 lakh). The couple’s goals include saving for emergencies, buying a bigger house, future child’s education and wedding, and their retirement. Financial Planner Pankaaj Maalde suggests they build the emergency corpus of Rs 3 lakh by assigning their cash, debt funds and surrender value of insurance policies. This should be invested in an ultra short term fund. The couple also wants to buy a bigger house worth Rs 1.75 crore in five years and they can allocate their two properties for the goal, which will help fund Rs 1.4 crore. 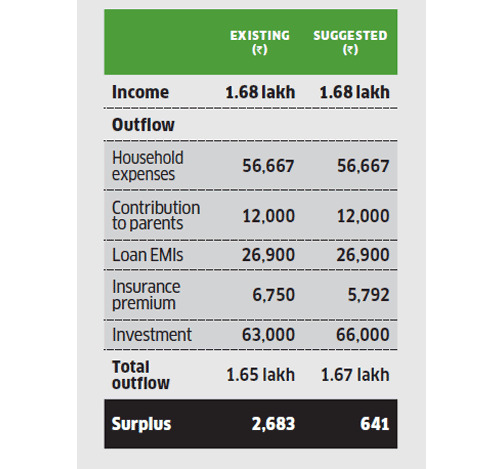 Since they want to make a down payment of Rs 1.52 crore, the remaining Rs 12 lakh can be amassed by investing Rs 15,000 a month in balanced funds. For the shortfall of Rs 22.7 lakh, they can take a loan and the EMI of Rs 22,400 can be furnished from the surplus and increase in salary. For the future child’s goal of education in 18 years, the couple wants to save Rs 1 crore. 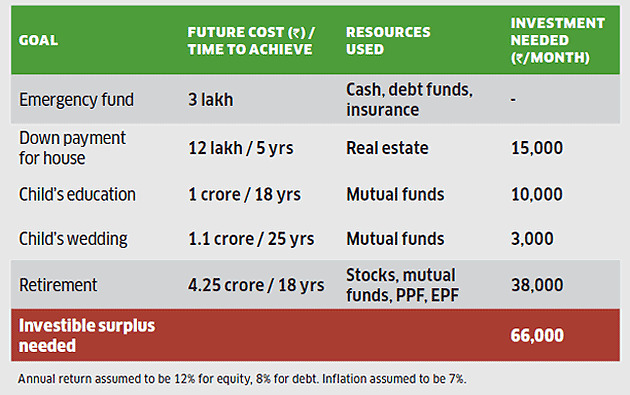 For this, they can assign a portion of mutual funds and continue the SIP of Rs 10,000 in an equity fund. For the wedding, they want to save Rs 1.1 crore in 25 years and again a portion of their mutual fund corpus can be assigned to the goal. In addition they can start an SIP of Rs 2,500 in an equity fund and Rs 500 in the gold bond scheme. For retirement, the couple will need Rs 4.25 crore in 18 years, and should allocate their stocks, mutual funds, PPF and EPF corpuses. They should also continue with an SIP of Rs 38,000 in a diversified equity fund. 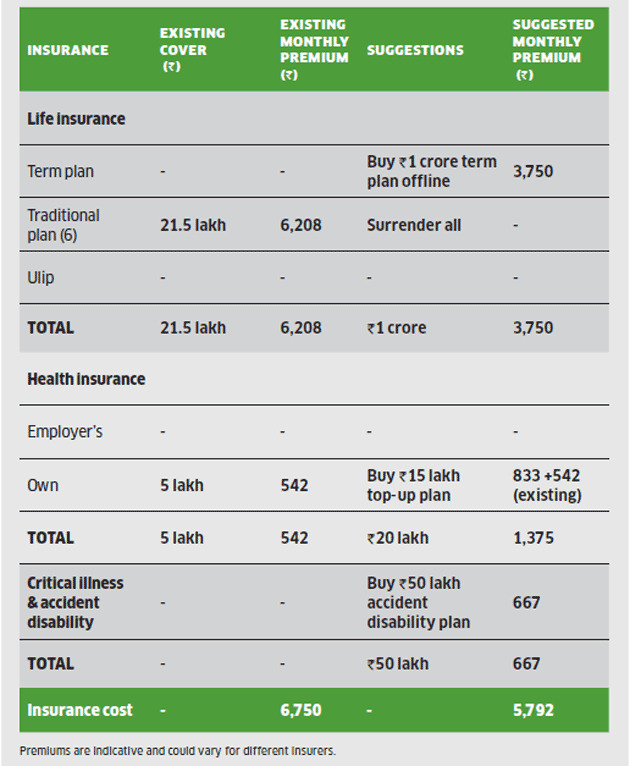 As for life insurance, they have six traditional plans worth Rs 21.5 lakh and Maalde suggests they surrender all the plans. Nishit should buy an offline term plan worth Rs 1 crore at Rs 3,750 a month. As for health insurance, the couple has a Rs 5 lakh family floater plan, and Maalde advises them to buy a top-up plan of Rs 15 lakh at Rs 833 a month. Nishit should also buy an accident disability plan of Rs 50 lakh at a monthly premium of Rs 667.